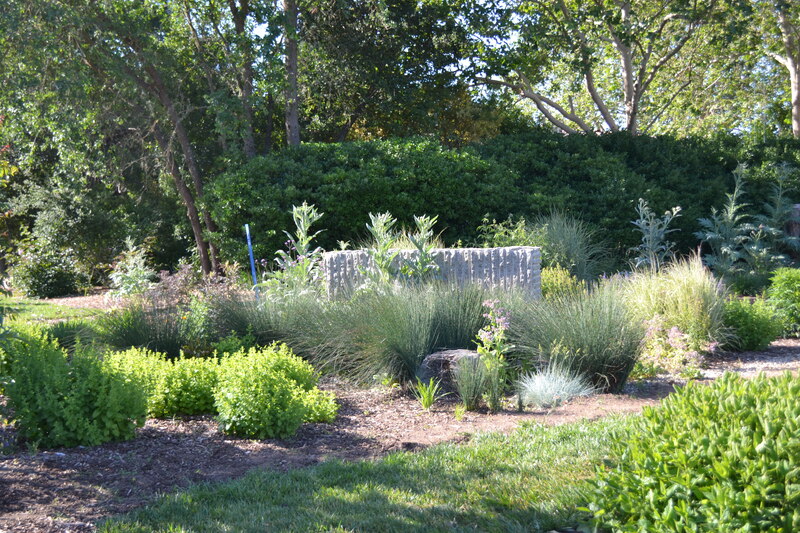 Thomas Keller’s nearly 3-acre garden is directly across from famed restaurant The French Laundry. 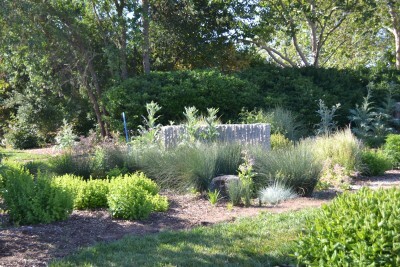 We walked by his garden multiple times throughout our stay. The view coupled with the overwhelming scent of honeysuckle, is awe inspiring every time! Just look at those artichoke plants! 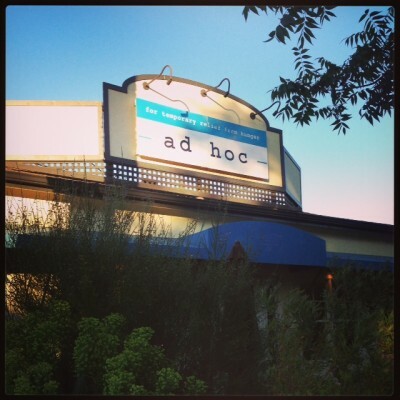 We chose to dine at Ad Hoc, another of Keller’s restaurants. This restaurant is incredible. The four course menu is set each night with no substitutions and served family style. It’s actually quite relaxing to not have to make any decisions. Another nice thing is that you are presented with a meal that goes together the way the chef envisioned. From our spiced vodka lemonades, the chopped romaine and watermelon salad, hanger steak with avocado crema and a potato/turnip gratin, steamed mussels in a bloody mary beer sauce, cheese course with honey and nuts, to the most fabulous almond basque cake – our dinner was nothing short of fantastic. And boy, were we full! I cannot recommend Ad Hoc highly enough. 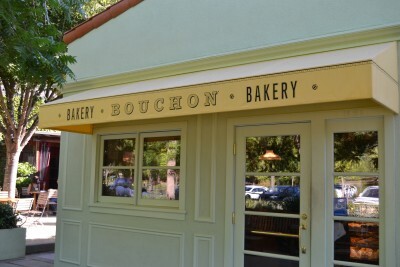 We also made sure to hit Keller’s Bouchon Bakery in the mornings… I mean, duh! 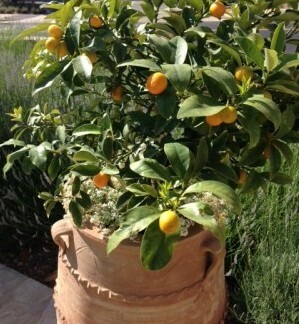 The Meyer lemon trees blew my mind! They were everywhere and incredibly lovely. 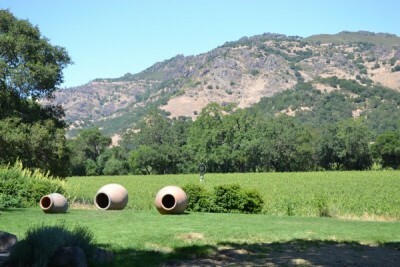 Above is a picture taken at Stag’s Leap Wine Cellars. Gorgeous property. 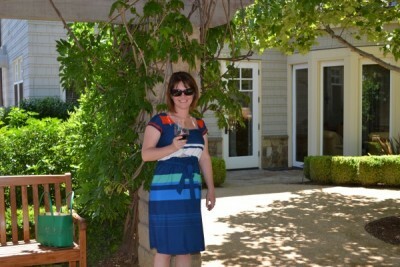 Another photo at Stag’s Leap- GREAT wine! 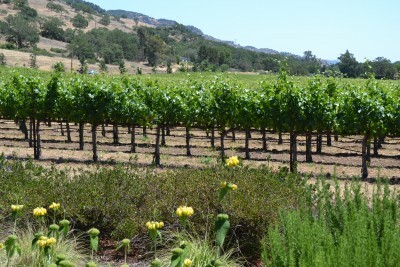 Vineyard at Paraduxx, a subsidiary of Duckhorn. 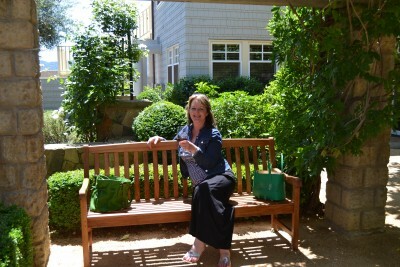 Absolute relaxation while tasting wines out on their patio. 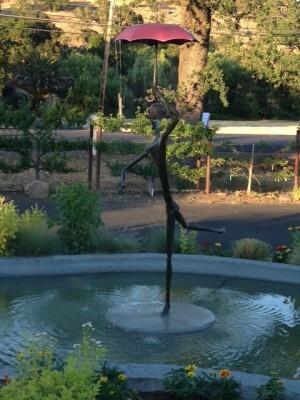 I just love this water feature outside Mustards Grill, a restaurant owned by Cindy Pawlcyn. 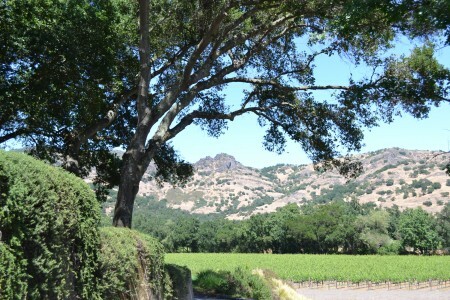 Pawlcyn is considered a pioneer of wine country cuisine and Mustards Grill has been open for over 30 years. What I loved most about our dinners in Napa Valley is how ingredients are prepared simply and allowed to shine. These chefs honor what’s in season and then elevate a seemingly simple dish into something extraordinary. 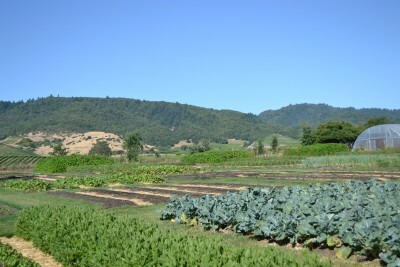 I am excited about the summer growing season and am inspired to recreate some of the dishes we had while in Napa. I harvested some beautiful lettuces today and will be looking through my new Mustards Grill and Ad Hoc cookbooks for some genius salad ideas! It sounds like it was an incredible trip! You and your mom know how to do it right and how special that just the two of you go to spend time together. 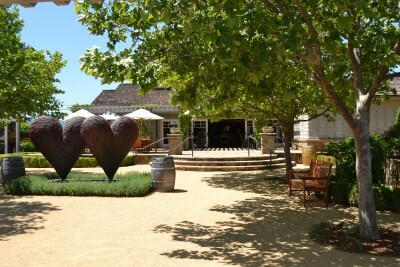 I have great memories as a kid, after a day of being drug to winery after winery, eating delicious dinners at Mustards Grill. I’ll reference this when we go down in July for Brock’s wedding so I know where to visit and eat!